A cello recital with a difference from two maverick geniuses, displaying the fecundity of their collaboration. The world-famous cellist Steven Isserlis, one of the best-loved instrumentalists of today, joins forces with composer and pianist Thomas Adès, described by the New York Times as one of the most imposing figures in contemporary music. At first glance, the pieces on this disc might seem to form a rather unexpected set of bedfellows. The names of Fauré and Kurtág, for instance, do not generally inhabit the same sentence. 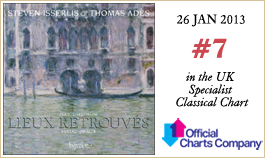 But there is a reason for this unusual state of affairs, which is that all of the composers on this album have been central to the musical development of Thomas Adès, whose Lieux retrouvés receives its first recording here. So we decided, rather than limiting the programme to two or three composers as is usual on a recording these days, that we would present a whole recital programme of works leading up to Lieux retrouvés, as well as the piece itself. And rather than my flailing around trying to describe how each composer has influenced Mr Adès, I thought it better to ask the man himself to provide brief explanations—which he has kindly done. The only works here dating from before the twentieth century are three pieces by Liszt—but La lugubre gondola, at least, could easily belong to a far later era, being a prime example of Liszt’s desire to ‘hurl his lance into the infinite sphere of the future’. The composer’s arrangements for cello (or violin) of the other two pieces derive from early songs, transformed in these versions into the sparer language of Liszt’s late years. Romance oubliée, originally a song dating from 1843, was heavily revised in versions for piano solo and for violin, cello and viola (all with piano) in 1880. Die Zelle in Nonnenwerth first saw life as a mournful lament in which the singer, shutting himself off from the world in the cloister at Nonnenwerth, bewails his abandonment. The song evidently held strong personal resonances for Liszt—not only because he was tempted by the monastic life, but also because the island of Nonnenwerth was a favourite holiday destination where he spent some summers with his young children before the family split up for ever. The fact that over a period of some forty years he made several vocal adaptations of this piece, as well as four versions for solo piano, one for piano duet, and this arrangement for violin or cello and piano, attests to his fondness for the work. La lugubre gondola was also the product of deep personal emotion. Liszt wrote two versions, the first inspired (he later claimed) by a premonition of Wagner’s death in Venice in 1883, the second (on which the cello version is based) by the death itself. What tragic music! One can hear the dark water lapping mournfully on the shore, the cries of the black-clad gondoliers, the grief-stricken prayers of the mourners. SI: I was surprised (and pleased) when you asked if we could play these Liszt pieces in the programme in which Lieux retrouvés was introduced. You have said that your intention in Lieux was that ‘the listener would in hearing the music of each section actually be as much present in each of the four places, as they are in the hall’. Was it this Proustian sense of lost places recreated that made the Liszt works such natural companions for Lieux? TA: Absolutely. No other great composer gives such a haunting sense of time and place as Liszt. Especially when there is a cello there. One really feels the sense of elsewhere. The germination of Janácek’s Pohádka was a long one. First performed in 1910 in a three-movement version, which its composer described as part of a projected longer work, it was revived in 1912, this time with four movements. When it was eventually published in 1923, however, it had again lost its last movement; this final version is the one we play here. The ‘tale’ of the title is based (loosely) on a story by the Russian poet V A Zhukovsky, catchily entitled ‘A Tale about Tsar Berendey, about his son Ivan the Tsarevich, about the Acumen of Immortal Kaschei and about the wise Tsarievna Maria, Kaschei’s Daughter’. In brief, as I understand it, the part of the story represented in Pohádka concerns the handsome Prince Ivan (initially conveyed by the cello in a dotted pizzicato motif—so appropriate that a noble, good-looking hero should be played by the cello), who falls in love with the beautiful Princess Maria. The only slight handicap to this otherwise ideal match is that her father is none other than Kaschei the Undead, King of the Underworld—perhaps not the ideal father-in-law for a young prince of good prospects. Nor does Kaschei consider Ivan the son-in-law of his dreams. In fact, for complicated reasons, he feels that he owns Ivan’s soul—you know how these Undead fathers-in-law are—and strongly objects to the match. The dreamy opening of the first movement, apparently representing the magical lake at which Ivan and Maria meet, leads to a touching love-duet; but after that the urgency increases, culminating in a passage of violent syncopations as Kaschei chases the young lovers on horseback. The second movement also begins with a strong sense of magic. The young lovers have reached safety at the palace of a neighbouring Tsar; but alas, all is not well, since this Tsar and Tsarina are rather too taken with young Ivan, fancying him as the perfect match for their own daughter and putting a spell on him, causing him to fall in love with said daughter. Maria reacts just as any normal adolescent girl would under these circumstances: she turns into a blue flower. The good news is that this draws from Janácek (near the opening of the movement) some meltingly lyrical music. And then, more good news: someone has the presence of mind to summon a wise magician, who breaks the spell. One can hear Ivan’s recovery in the return of his initial dotted rhythm, now played arco (bowed) rather than pizzicato (plucked). To demonstrate his return to health, he shoots right up to a searing top B flat. Sometimes in performance I’ve wondered whether Ivan, to demonstrate his newly found vigour, climbs to the top of a tree, where he finds a rather desperate cat bawling at the top of its voice; but that probably isn’t the intended effect. In the last movement, Ivan and Maria have reached the sanctuary of Ivan’s parents’ palace, where they tell of their love and their adventures, celebrate, and live happily ever after—well, as happily as one can live in the key of G flat major. SI: I know that you have always been especially enthusiastic about Janácek, and have often performed his music. There seems to be a strong correspondence between the opening of Pohádka and the opening of Lieux—both depicting water. What attracts you particularly? TA: Janácek is unique and Pohádka is one of his most magical pieces. Every gesture has the potency of a story told to a child. Gabriel Fauré’s second Cello Sonata was written towards the end of the composers life, in 1921. Already profoundly deaf for many years, he was becoming increasingly feeble—and yet managed, miraculously, to produce music pulsing with joyous, ecstatic energy. This energy is conveyed throughout the first movement by constant syncopations in the accompaniment, every beat (except one—full marks if you can spot it!) in the main body of the movement containing off-beat quavers which drive the soaring melodies to ever-greater heights. The slow movement, originally a funeral march written to commemorate the centenary of Napoleon’s death, was first composed for wind band; but it fits perfectly into this sonata. The noble opening lament is reminiscent of Faure’s famous Élégie for cello, Op 24; but the gentle major sections take us closer to the world of his Requiem. The last movement is euphoric; perhaps it can be seen, or heard, or felt as a celebration of the beauty of nature, with its panoply of wild storms, windswept leaves and gentle sunlight. SI: I remember that when we first met, I was delighted to realize that we shared a passion for the music of Fauré, and in particular for the late works, with their constant ecstasy—as if the music never touches the ground. How does he do it? 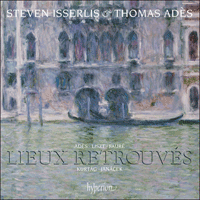 TA: The late Fauré has a unique quality of inner illumination and rapture. This is achieved with a supreme technical ellipsis which informs every bar of the music. Many of György Kurtág’s recent works (several of them, including all but the first of the sequence recorded here, enfolded into his series of pieces entitled Signs, Games and Messages) have been miniatures—if that is not a misleading term for works of such deep layers of meaning and significance. For Steven: In Memoriam Pauline Mara was his (much appreciated) response to the news of the death of my wife Pauline in 2010. As I told him when I worked on the piece, I cannot possibly think of the extra-musical associations as I play it; but its feelings of lament, of the relentlessness of fate and of consolatory prayer are universal. A riverside which is not a riverside. and a fiery pin in the head. Kurtág’s response, while full of inner pain, is also tender, its chromatic falling sighs evoking a memory of the Sarabande of Bach’s fifth Suite. Only the final pizzicato chord evokes the ‘fiery pin in the head’. The last two pieces in this group stray into the region of the barely audible; both call for the heaviest possible mute, softening the sound of the cello to an ethereal smoulder. They are formed from the simplest of musical materials, mostly descending scales—music reduced to its bare essentials. SI: I know that Kurtág has been a major influence on you, and that your university thesis was devoted to his music. (I understand that you got a starred first for it—there, I’m boasting on your behalf!) You don’t seem to have taken his intense brevity as a model for most of your works, though. In fact, having worked extensively with both of you, it seems to me that your personalities are very different in almost every way. What are the similarities? Can you describe what you have learned from him? TA: I knew and adored Kurtág’s music before I met him—it communicates so directly, which is rare in music from that generation. I understood from him that the way a note is played, or indeed written, is a matter of life or death. SI: This piece is nothing short of fiendish! In purely technical terms, it is the hardest piece I have ever learned—especially the last movement. I’m sure you remember that at one point before the first performance I told you that I just couldn’t—and wouldn’t—play it. You gently replied that that was fine, it wasn’t anyone’s fault, and that someone else would have to give the first performance instead … at which point I determined that I would most definitely play it! (And have done so at every opportunity since.) Now, I know that you plan to have a cello burned onstage in your forthcoming opera; but am I to take it that the reason for these mind-and-body-boggling demands is not actually that you hate cellos or cellists, but rather that you love to stretch the capabilities of the instruments for which you write? I really don’t think that the cello part could be played on any other instrument (even if I did suggest that you transcribe it for violin, but an octave lower); it’s just that you are demanding things from the cello that no one has ever demanded before. What qualities particularly attract you to the cello? And is it OK to describe your music in the simple pictorial terms that I have used in my note above? TA I don’t know what to say! It’s all true. I don’t know why it is that the cello of all instruments makes one dream of Elsewhere when one hears it. Perhaps because the colours are so rich and wide-ranging, one can dream and find oneself in a different place. I believe that music is a vehicle that can carry you from where you are to a different place. De prime abord, on pourrait croire que les pièces réunies ici forment un curieux mélange, les noms de Fauré et de Kurtág, par exemple, étant rarement associés dans la même phrase. Mais il y a une raison à cette curiosité: tous les compositeurs de cet enregistrement ont été essentiels au développement musical de Thomas Adès, dont les Lieux retrouvés sont enregistrés ici pour la première fois. Au lieu de restreindre le programme à deux ou trois compositeurs, comme le veut l’usage actuel, nous avons donc décidé de présenter tout un récital d’œuvres menant à Lieux retrouvés. Et plutôt que de m’évertuer à tenter de décrire comment chaque compositeur a influencé M. Adès, j’ai préféré lui demander de brèves explications—qu’il m’a fournies en toute gentillesse. Les seules œuvres antérieures au XXe siècle sont trois pièces de Liszt—encore que La lugubre gondola pourrait sans peine être bien plus tardive, elle qui illustre à merveille le désir lisztien d’«envoyer sa lance dans la sphère infinie du futur». Les arrangements pour violoncelle (ou violon) des deux autres pièces concernent des mélodies anciennes, métamorphosées, ici, dans la langue plus raréfiée des dernières années du compositeur. Romance oubliée, originellement une mélodie de 1843, fut fortement révisée en 1880, dans des versions pour piano solo et pour violon, violoncelle et alto (tous avec piano). Die Zelle in Nonnenwerth fut d’abord une lamentation dolente dans laquelle le chanteur, retiré du monde dans le cloître de Nonnenwerth, pleure son abandon. Une mélodie qui, à l’évidence, éveilla en Liszt de fortes résonnances—non seulement la vie monastique le tentait, mais l’île de Nonnenwerth comptait parmi ses lieux de villégiature favoris (il y passa plusieurs étés avec ses jeunes enfants, avant que la famille ne se séparât à jamais). Qu’il ait, en quarante ans, multiplié les adaptations vocales de cette pièce, dont il réalisa aussi quatre versions pour piano solo, une pour duo pianistique plus le présent arrangement pour violon ou violoncelle et piano, dit combien il l’affectionnait. La lugubre gondola fut, elle aussi, le fruit d’une profonde émotion personnelle. Il en écrivit deux versions, inspirées l’une par une prémonition de la mort de Wagner en 1883 (c’est du moins ce qu’il affirmera), l’autre (sur laquelle repose la version pour violoncelle) par la mort même. Quelle musique tragique! On entend les eaux sombres clapoter, lugubrement, contre le rivage, les cris des gondoliers tout de noir vêtus, les prières douloureuses des éplorés. S.I. : J’ai été surpris (et ravi) quand vous m’avez demandé si nous pouvions inclure ces œuvres de Liszt dans le programme où Lieux retrouvés était présenté. Vous avez dit que, dans cette œuvre, votre intention était que «les auditeurs, en entendant la musique de chaque section, soient véritablement aussi présents dans chacun des quatre lieux que dans la salle». Était-ce ce sentiment proustien des lieux perdus recréés qui faisait des œuvres de Liszt des compagnons si naturels de Lieux? T.A. : Absolument. Aucun autre grand compositeur ne donne un tel sentiment lancinant du temps et du lieu. Surtout quand il y a un violoncelle. On a vraiment la sensation d’un ailleurs. La gestation de Pohádka de Janácek fut longue. Jouée pour la première fois en 1910 dans une version en trois mouvements s’inscrivant, dit le compositeur, dans un projet de plus grande envergure, cette pièce refit surface en 1912, mais avec quatre mouvements. Lorsqu’elle fut enfin publiée, en 1923, ce fut, cependant, sans son dernier mouvement, et c’est cette ultime version que nous interprétons ici. Le «conte» du titre repose (vaguement) sur une histoire du poète russe V. A. Zhukovsky, au titre accrocheur: «Un conte sur le tsar Berendey, sur son fils Ivan le tsarévitch, sur la perspicacité de l’immortel Kaschei et sur la sage Tsarievna Maria, la fille de Kaschei.» Pour faire court, et comme je comprends les choses, la partie de l’histoire présentée dans Pohádka concerne le beau prince Ivan (initialement véhiculé par le violoncelle dans un motif pointé en pizzicato—tellement bienvenu que le violoncelle devrait toujours incarner un héros beau et vaillant), qui s’amourache de la jolie princesse Maria. Seul léger handicap pour ce couple par ailleurs idéal: le père de la demoiselle, qui n’est autre que Kaschei le Non-mort, roi des Enfers—peut-être pas le beau-père idéal pour un jeune homme promis à un bel avenir. D’autant que Kaschei, de son côté, ne voit pas en Ivan le gendre de ses rêves. En vérité, pour des raisions complexes, il sent qu’il détient l’âme d’Ivan—ces beaux-pères des Enfers, vous savez bien comment ils sont—et s’oppose fermement au mariage. L’ouverture onirique du premier mouvement, incarnation évidente du lac magique où Ivan et Maria se rencontrent, mène à un touchant duo d’amour; mais ensuite, l’urgence croît pour culminer en un passage de violentes syncopes alors que Kaschei pourchasse à cheval les tourtereaux. Le deuxième mouvement démarre, lui aussi, sur un fort sentiment de magie. Les jeunes amants ont réussi à se réfugier dans le palais d’un tsar voisin; mais hélas, tout ne va pas pour le mieux, car le tsar et la tsarine s’intéressent bien trop au jeune Ivan, parfait prétendant, à leurs yeux, pour leur propre fille: ils lui jettent un sort qui le fait tomber amoureux de ladite demoiselle. Maria réagit comme le ferait toute adolescente normale en pareilles circonstances: elle se métamorphose en fleur bleue. La bonne nouvelle, c’est que cela inspire à Janácek (vers le début du mouvement) une musique d’un lyrisme attendrissant. Et l’autre bonne nouvelle, c’est que quelqu’un a la présence d’esprit de convoquer un sage magicien, qui rompt le charme. On entend qu’Ivan recouvre ses esprits quand revient son rythme pointé initial, désormais joué arco (avec archet) et non plus pizzicato (pincé). Pour montrer qu’il se remet, il grimpe jusqu’à un si bémol aigu fulgurant. En concert, je me suis parfois demandé si Ivan, pour montrer sa vigueur frais retrouvée, ne grimpait pas en haut d’un arbre, où il découvrirait un chat assez désespéré, braillant à pleins poumons; mais ce n’est probablement pas là l’effet recherché. Dans le dernier mouvement, Ivan et Maria ont atteint le palais-sanctuaire des parents du jeune homme: ils y racontent leur amour, leurs aventures, font la fête et vivent à jamais heureux—enfin, aussi heureux qu’on puisse vivre en sol bémol majeur. S.I. : Je sais que vous avez toujours été extrêmement passionné par Janácek et que vous avez souvent joué sa musique. Il semble y avoir une forte correspondance entre le début de Pohádka et celui de Lieux—deux évocations de l’eau. Qu’est-ce qui vous attire en particulier? T.A. : Janácek est unique et Pohádka est l’une de ses pièces les plus magiques. Chaque geste a la puissance d’une histoire racontée à un enfant. Gabriel Fauré composa sa Sonate pour violoncelle nº 2 vers la fin de sa vie, en 1921. Sourd profond depuis des années déjà, il s’affaiblissait de plus en plus—mais, miracle, parvenait encore à produire une musique vibrante d’énergie joyeuse, extatique. Cette énergie, le premier mouvement la véhicule par de constantes syncopes dans l’accompagnement, chaque temps (sauf un—dix sur dix si vous trouvez lequel!) du corps principal du mouvement contenant des croches syncopées qui poussent les mélodies filantes vers des sommets toujours plus hauts. Le mouvement lent, originellement une marche funèbre écrite pour commémorer le centenaire de la mort de Napoléon, fut d’abord composé pour un orchestre d’instruments à vent; mais il s’intègre parfaitement dans cette sonate. La majestueuse lamentation inaugurale rappelle la célèbre Élégie pour violoncelle op. 24 de Fauré, tandis que les tendres sections en majeur nous rapprochent de l’univers de son Requiem. Le dernier mouvement, euphorique, donne peut-être à voir, à entendre, à sentir une célébration de la beauté de la nature, avec toute sa panoplie de tempêtes déchaînées, de feuilles balayées par le vent et de doux soleil. S.I. : Je me souviens que lors de notre première rencontre, j’ai été enchanté de m’apercevoir que nous avions une passion commune pour la musique de Fauré, notamment pour ses œuvres tardives, à l’extase permanente—comme si la musique ne touchait jamais terre. Comment fait-il cela? T.A. : Le Fauré dernière manière a une illumination et un ravissement intérieurs uniques, qu’il obtient en imprégnant chaque mesure d’une suprême ellipse technique. Nombre des œuvres récentes de György Kurtág (dont plusieurs, y compris toute la séquence enregistrée ici [sauf le premier morceau], enveloppaient sa série de pièces intitulée Signes, jeux et messages) sont des miniatures—un terme peut-être trompeur pour des œuvres avec de si profondes strates touchant le sens et la portée du propos. For Steven: In Memoriam Pauline Mara fut sa réaction (appréciée à sa juste valeur) à l’annonce de la mort de ma femme Pauline, en 2010. Comme je le lui ai dit en travaillant l’œuvre, je ne peux peut-être pas penser à des associations extramusicales quand je la joue, mais ses sentiments de lamentation, de sort implacable et de prières consolantes sont universels. Une rive qui n’est pas une rive. et une ardente épingle dans la tête. Quoique toute de douleur intime, l’œuvre de Kurtág est tendre, avec ses soupirs chromatiques descendants qui rappellent la Sarabande de la Suite nº 5 de Bach. Seul l’ultime accord en pizzicato évoque l’«ardente épingle dans la tête». Les deux dernières pièces de ce corpus, qui s’aventurent dans l’à peine audible, exigent la plus forte sourdine possible, adoucissant la sonorité du violoncelle en une fumée éthérée. Elles sont bâties du plus simple des matériaux musicaux, pour l’essentiel des gammes descendantes—la musique réduite à ses fondamentaux épurés. Dans Schatten (Ombres), de sombres silhouettes détalent, tout justes discernables dans la quiétude qui les enveloppe; c’est comme si d’autres ombres se tapissaient dans la nuit, abritées dans le silence. L’ambiance rappelle le fantôme du Hamlet de Shakespeare: «Il est ici!—Il est ici!—Il est parti!». S.I. : Je sais que Kurtág a exercé sur vous une influence majeure et que votre thèse universitaire était consacrée à sa musique. (Je comprends qu’elle vous ait valu une mention très bien—là, je me vante à votre place!) Pourtant, la plupart de vos œuvres ne semblent pas avoir pris modèle sur son intense brièveté. En fait, après avoir beaucoup travaillé avec vous deux, il me semble que vos personnalités sont extrêmement différentes, presque en tout point. En quoi vous retrouvez-vous? Pouvez-vous préciser ce que vous avez appris de lui? T.A. : Je connaissais et j’adorais la musique de Kurtág avant de le rencontrer—il communique de manière très directe, ce qui est rare dans la musique de cette génération. Avec lui, j’ai compris que la façon dont une note est jouée ou, au vrai, écrite, est une question de vie ou de mort. S.I. : Cette pièce est tout simplement démoniaque! En termes purement techniques, c’est le morceau le plus difficile que j’aie jamais appris—surtout le dernier mouvement. Vous vous rappelez, j’en suis sûr, qu’à un moment, avant la première, je vous ai dit que je ne pouvais pas la jouer et que je ne la jouerais pas. Vous m’avez gentiment répondu que c’était bien, que ce n’était la faute de personne mais qu’il faudrait bien que quelqu’un d’autre la crée … j’ai alors décidé de la jouer à tout prix! (Et je l’ai fait, depuis, dès que j’en ai eu l’occasion.) Je sais que vous envisagez de faire brûler un violoncelle sur scène dans votre prochain opéra; si vous avez ces exigences qui déroutent le corps et l’esprit, ce n’est pas, je suppose, que vous haïssez les violoncelles ou les violoncellistes, mais juste que vous adorez étirer les capacités des instruments pour lesquels vous composez, non? Je ne pense vraiment pas que la partie de violoncelle pourrait être jouée sur un autre instrument (même si je vous ai bel et bien suggéré de la transcrire pour violon, mais une octave plus bas); simplement, vous exigez du violoncelle des choses que personne n’a encore jamais exigées. Quelles qualités vous attirent particulièrement vers le violoncelle? Est-il correct de décrire votre musique en termes picturaux simples comme je viens de le faire ici? T.A. : Je ne sais pas quoi dire! Tout cela est vrai. J’ignore pourquoi, de tous les instruments, c’est le violoncelle qui, quand on l’entend, fait rêver d’ailleurs. Peut-être parce que ses couleurs sont tellement riches et vastes qu’on peut rêver et se retrouver autre part. Je crois que la musique est un véhicule qui peut vous emmener de là où vous êtes dans un autre lieu. Auf den ersten Blick mag die Zusammenstellung der hier vorliegenden Werke etwas eigenartig anmuten. Die Namen Fauré und Kurtág beispielsweise kommen nicht oft in ein und demselben Satz vor. Doch gibt es einen Grund für diese ungewöhnliche Vorgehensweise—alle auf dieser CD vertretenen Komponisten spielten eine entscheidende Rolle in der künstlerischen Entwicklung Thomas Adès’, dessen Lieux retrouvés hier erstmals eingespielt wurde. So kamen wir zu dem Entschluss, unser Programm nicht auf zwei oder drei Komponisten zu beschränken, wie es heutzutage bei Aufnahmen üblich ist, sondern stattdessen ein ganzes Konzertprogramm zu präsentieren, in dem die Werke, die zu der Entstehung von Lieux retrouvés beigetragen haben, wie auch das Stück selbst, enthalten sind. Und anstatt mich abzumühen und zu versuchen, zu erklären, inwiefern die jeweiligen Komponisten Herrn Adès im Einzelnen beeinflusst haben, dachte ich, es sei sinnvoller, ihn selbst um kurze Erläuterungen zu bitten—die er freundlicherweise zur Verfügung gestellt hat. Die einzigen hier vorliegenden Werke, die vor dem 20. Jahrhundert entstanden, sind die drei Stücke von Liszt, obwohl zumindest Die Trauergondel ohne Weiteres auch einer deutlich späteren Zeit entstammen könnte, denn sie ist ein Paradebeispiel für Liszts Wunsch, „seine Lanze in die unendliche Sphäre der Zukunft zu werfen“. Die Arrangements des Komponisten der anderen beiden Werke für Violoncello (oder Violine) gehen auf frühe Lieder zurück, sind jedoch in die sparsamere Tonsprache des späten Liszt geradezu transformiert. Romance oubliée, ursprünglich ein Lied aus dem Jahre 1843, wurde 1880 stark überarbeitet und für Klavier solo, Geige, Violoncello und Bratsche (letztere alle jeweils mit Klavier) umgestaltet. Die Zelle in Nonnenwerth war zunächst ein melancholisches Lamento, in dem der Sänger, der sich von dem Klosterleben in Nonnenwerth abkapselt, seine Verlassenheit beklagt. Dieses Lied rief bei Liszt offenbar starke persönliche Resonanzen hervor—nicht nur weil das Mönchsleben einen gewissen Reiz auf ihn ausübte, sondern auch weil er auf der Rheininsel Nonnenwerth mehrere Familienurlaube verbracht hatte, als seine Kinder noch klein waren und bevor die Familie sich für immer trennte. Die Tatsache, dass er über einen Zeitraum von rund 40 Jahren das Stück immer wieder bearbeitete—mehrfach für Singstimme, vier Versionen für Klavier solo, eine für Klavierduo sowie dieses Arrangement für Geige oder Cello und Klavier—zeigt den Stellenwert an, den es für ihn einnahm. Die Trauergondel war ebenfalls das Ergebnis tiefer persönlicher Emotion. Liszt komponierte zwei Versionen, wobei die erste (wie er später behauptete) von einer Vorahnung von Wagners Tod in Venedig im Jahre 1883 inspiriert war, und die zweite (die der Cello-Version zugrunde liegt) von dem Tod selbst. Welch’ tragische Musik! Man kann hören, wie das dunkle Wasser melancholisch-sanft an das Ufer schlägt, und dazu die Rufe der schwarzgekleideten Gondolieri und die kummervollen Gebete der Trauernden. S.I. : Ich war überrascht (und auch erfreut) darüber, als Du mich fragtest, ob wir diese Liszt-Stücke in das Programm mit aufnehmen könnten, in dem Lieux retrouvés vorgestellt werden sollte. Du hast gesagt, dass Du mit Lieux retrouvés erreichen wolltest, dass „der Zuhörer beim Hören der Musik ebenso in allen vier Orten anwesend ist wie im Konzertsaal“. War es jene Proust’sche Neigung für wiederbelebte verlorene Orte, die dafür sorgte, dass die Liszt-Werke mit Lieux retrouvés so gut zusammenpassen? T.A. : Ganz genau. Kein anderer großer Komponist vermittelt einen derartig ergreifenden Eindruck von Zeit und Ort wie Liszt. Besonders wenn ein Cello dabei ist. Man spürt wahrhaftig den Eindruck des Anderswo. Janáceks Pohádka hatte eine lange Entstehungszeit. Es wurde erstmals im Jahre 1910 in einer dreisätzigen Fassung aufgeführt, die der Komponist als Teil eines geplanten längeren Werks deklarierte. 1912 wurde es nochmals aufgeführt und hatte inzwischen noch einen vierten Satz hinzugewonnen. Als es 1923 jedoch schließlich veröffentlicht wurde, hatte es den letzten Satz wieder verloren, und es ist jene letzte Version, die wir hier eingespielt haben. Die „Geschichte“ des Titels bezieht sich (lose) auf eine Märchenerzählung des russischen Dichters Wassili Schukowski, die den griffigen Titel trägt: „Eine Erzählung vom Zaren Berendei, von seinem Sohn, dem Zarewitsch Iwan, von der Klugheit des Unsterblichen Koschtschei und von der weisen Zarin Marja, der Tochter des Koschtschei“. Kurz gesagt, so wie ich es verstehe, handelt der Teil der Märchens, der in Pohádka dargestellt wird, von dem attraktiven Prinzen Iwan (der zunächst vom Cello mit einem punktierten Pizzicato-Motiv dargestellt wird—ganz treffend, dass ein nobler, gutaussehender Held vom Cello gespielt wird), der sich in die schöne Prinzessin Marja verliebt. Der einzige Haken bei dieser sonst idealen Partie ist, dass ihr Vater niemand anders als Koschtschei der Todeslose ist, der König der Unterwelt—vielleicht nicht der optimale Schwiegervater für einen jungen Prinzen mit guten Aussichten. Und seinerseits betrachtet auch der Koschtschei Iwan nicht als den Schwiegersohn seiner Träume. Tatsächlich meint er sogar (aufgrund einer komplizierten Sachlage), dass er Iwans Seele besitzt—Sie verstehen, wie diese Todeslosen Schwiegerväter eben sind—und erhebt stärkste Einwände gegen die Partie. Der träumerische Beginn des ersten Satzes, der wohl den magischen See darstellt, wo Iwan und Marja sich treffen, geht in ein anrührendes Liebesduett über. Danach jedoch steigert sich der Druck und kulminiert in einer Passage heftiger Synkopierungen, wenn der Koschtschei das Liebespaar zu Pferde jagt. Der zweite Satz beginnt ebenfalls mit einer starken zauberischen Komponente. Das Paar hat sich zu dem Palast eines benachbarten Zaren retten können, doch ist dies noch kein glückliches Ende, da dieser Zar und die Zarin den jungen Iwan etwas zu sehr mögen, ihn mit ihrer Tochter verheiraten wollen und ihn mit einem Zauber belegen, woraufhin er sich in diese Tochter verliebt. Marja reagiert, wie jedes normale junge Mädchen es in einem solchen Falle tun würde: sie verwandelt sich in eine blaue Blume. Das Gute hieran ist, dass Janácek dazu (am Anfang des Satzes) wunderschöne lyrische Musik komponiert. Und dann kommen noch mehr gute Nachrichten: jemand besitzt die Geistesgegenwart, einen weisen Magier zu rufen, der den Zauber bricht. Iwans Genesung ist in der Wiederkehr seines anfänglichen punktierten Rhythmus zu hören, der nun Coll’arco (gestrichen) und nicht mehr Pizzicato (gezupft) gespielt wird. Um seine wiederhergestellte Gesundheit zu demonstrieren, schnellt er zu einem schneidenden hohen B hinauf. Bei Aufführungen habe ich mich manchmal gefragt, ob Iwan, um seine gerade wiedererlangte Lebenskraft zu demonstrieren, auf einen Baum hinaufklettert und dort eine verzweifelt schreiende Katze vorfindet—doch ist das wahrscheinlich nicht der beabsichtigte Effekt. Im letzten Satz haben Iwan und Marja einen echten Zufluchtsort erreicht, nämlich den Palast von Iwans Eltern, wo sie von ihrer Liebe und ihren Abenteuern erzählen, feiern und bis ans Ende ihrer Tage glücklich miteinander leben—beziehungsweise so glücklich, wie man in Ges-Dur leben kann. S.I. : Ich weiß, dass Du Janácek immer besonders gemocht und seine Musik oft aufgeführt hast. Zwischen dem Beginn von Pohádka und dem Beginn von Lieux retrouvés scheint es eine starke Verbindung zu geben, da beide Wasser darstellen. Was zieht Dich dabei besonders an? T.A. : Janácek ist einzigartig und Pohádka ist eines seiner zauberhaftesten Stücke. Jede Geste besitzt die Wirkungskraft einer Geschichte, die einem Kind erzählt wird. Die zweite Cellosonate von Gabriel Fauré entstand im Jahre 1921, gegen Ende des Lebens des Komponisten. Er war bereits seit vielen Jahren sehr taub und wurde immer schwächer, doch gelang es ihm wie auf wundersame Weise, Musik von pulsierender Freude und ekstatischer Energie zu komponieren. Diese Energie macht sich im gesamten ersten Satz durch konstante Synkopierungen in der Begleitung bemerkbar; in jeder Zählzeit (bis auf eine—hundert Punkte, wenn Sie diese identifizieren!) im Hauptteil des Satzes erklingen synkopierte Achtel, durch die die aufsteigenden Melodien sich immer weiter emporschwingen. Der langsame Satz, ursprünglich ein Trauermarsch und anlässlich des 100. Todestages von Napoleon entstanden, war zunächst für Bläserensemble komponiert worden, doch passt er perfekt in diese Sonate hinein. Das noble Lamento zu Beginn erinnert an Faurés berühmte Élégie für Cello op. 24, doch die sanften Dur-Passagen transportieren den Hörer eher in die Sphäre seines Requiems. Der letzte Satz ist euphorisch; vielleicht kann er als Feier der Schönheit der Natur mit ihrer Palette von wilden Stürmen, umherwirbelnden Blättern und sanftem Sonnenschein verstanden werden. S.I. : Als wir uns kennenlernten, stellte ich mit Genugtuung fest, dass wir eine Leidenschaft für die Musik Faurés teilen und insbesondere für die späten Werke mit ihrer stetigen Ekstase—als ob die Musik nie den Boden berührt. Wie schafft er das? T.A. : Das Spätwerk Faurés besitzt eine ihm eigene Qualität der inneren Erhellung und Verzückung. Dies wird durch eine hervorragende technische Ellipse erreicht, die jeden Takt der Musik inspiriert. Viele der neueren Werke von György Kurtág (von denen mehrere, wie auch alle hier vorliegenden Stücke—mit der Ausnahme des ersten—, Teil seiner Serie von Werken mit dem Titel Signs, Games and Messages sind) sind Miniaturen—wenn das nicht eine irreführende Bezeichnung für Werke von derart tiefreichenden Bedeutungsschichten ist. For Steven: In Memoriam Pauline Mara war seine (sehr geschätzte) Reaktion auf die Todesnachricht meiner Frau Pauline im Jahr 2010. Wie ich ihm schon sagte, als ich an dem Stück arbeitete, kann ich beim Spielen des Werks unmöglich an die außermusikalischen Verbindungen denken; doch die hier ausgedrückte Klage, Unnachgiebigkeit des Schicksals und tröstlichen Gebete sind universell. Ein Flussufer, das kein Flussufer ist. und eine feurige Nadel im Kopf. Kurtágs Reaktion ist zwar voller innerer Qual, jedoch gleichzeitig auch sanft, wobei die chromatischen abfallenden Seufzer an die Sarabande aus Bachs fünfter Suite erinnern. Erst der letzte Pizzicato-Akkord stellt die „feurige Nadel im Kopf“ dar. Die letzten beiden Stücke dieser Gruppe befinden sich in der Region des kaum Hörbaren; in beiden wird der stärkste Dämpfer verlangt, so dass der Celloklang zu einem ätherischen Glimmen abgemildert wird. Die Werke setzen sich aus sehr schlichtem musikalischen Material zusammen, hauptsächlich aus absteigenden Tonleitern: Musik, die auf das Wesentliche reduziert ist. S.I. : Ich weiß, dass Kurtág großen Einfluss auf Dich hat, und dass Deine Dissertation seiner Musik gewidmet war (und ich glaube, dass Du eine besondere Auszeichnung dafür erhalten hast—so, nun habe ich etwas für Dich geprahlt!). Bei dem Großteil Deiner Werke scheinst Du jedoch seine intensive Kürze Dir nicht zum Vorbild genommen zu haben. Vielmehr habe ich den Eindruck, nachdem ich sowohl mit Dir als auch mit Kurtág viel zusammen gearbeitet habe, dass Ihr völlig unterschiedliche Persönlichkeiten seid. Worin liegen die Ähnlichkeiten? Kannst Du beschreiben, was Du von ihm gelernt hast? T.A. : Ich kannte und schätzte Kurtágs Musik bereits, bevor ich ihn kennenlernte—sie kommuniziert so direkt, was bei Musik seiner Generation sonst nur selten vorkommt. Ich habe von ihm gelernt, dass die Art und Weise, in der ein Ton gespielt, beziehungsweise geschrieben wird, eine Existenzfrage ist. S.I. : Dieses Stück ist absolut teuflisch! Rein technisch gesehen ist es das schwerste Stück, das ich je gelernt habe—besonders der letzte Satz. Du erinnerst Dich sicherlich an die Situation vor der ersten Aufführung, als ich Dir sagte, dass ich es einfach nicht spielen könne—und wolle. Du gabst darauf behutsam zurück, dass das in Ordnung und niemandes Schuld sei und dass dann jemand anders die Premiere übernehmen müsse … woraufhin ich beschloss, es auf jeden Fall zu spielen (und das seitdem bei jeder Gelegenheit getan habe)! Ich weiß, dass Du in Deiner nächsten Oper unter anderem ein Cello auf der Bühne verbrennen willst, aber soll ich das so verstehen, dass der Grund für diese unglaublichen geistigen und körperlichen Anforderungen nicht darin liegt, dass Du Celli oder Cellisten hasst, sondern dass Du vielmehr mit Vorliebe die Möglichkeiten der Instrumente, für die Du schreibst, so weit wie möglich ausdehnst? Ich glaube wirklich nicht, dass die Cellostimme von einem anderen Instrument gespielt werden könnte (selbst wenn ich Dir den Vorschlag machte, das Stück für Geige umzusetzen, nur eine Oktave tiefer); es ist nur einfach so, dass Du von dem Cello Dinge verlangst, die ihm noch nie abverlangt worden sind. Welche Eigenschaften des Cellos findest Du besonders anziehend? Und ist es in Ordnung, Deine Musik in der einfachen bildhaften Weise zu beschreiben, wie ich es oben getan habe? T.A. : Ich weiß nicht, was ich sagen soll! Es ist alles wahr. Ich weiß nicht, warum gerade das Cello einen dazu verleitet, vom Anderswo zu träumen, wenn man es hört. Vielleicht, weil die Klangfarben so reichhaltig und breitgefächert sind, kann man träumen und sich an einem anderen Ort wiederfinden. Ich glaube, dass Musik ein Vehikel ist, das den Hörer an einen anderen Ort transportieren kann.